A rambling on our wedding and anything else. It really happened, Sydney and Corey are happily married and here is the video to prove it. Don’t get your hopes up, I’m not sure this is going to work however I wanted to be prepared just in case. 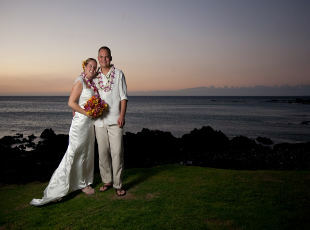 The wedding and possibly other events may be streamed live from Hawaii. I will not provide any tech support so do not ask and I will not make any guarantees that we will stream at all. Check out the Streaming Page of Doom. The Hawaii Volcanoes National Park is open 24 hours a day, year round. It is also home to the Kilauea Visitor Center, and the Jaggar Museum where you can get a little schooling and culture on the volcano. Please note that there is an entrance fee to the national park. The entrance fee will cost you $10/car (including all passengers) and is good for 1 week. Just take a word of advice, 8 years ago Corey and I make a similar hike out to the surface flows from the end of the Chain of Craters Road. Our round trip was maybe 4-5 miles. Those 4-5 miles took us a good 8+ hours (granted there was some serious goofing off involved, but a good portion of the time spent was walking) to make it there and back. Choose wisely about your course of actions because the hike is now days, is not just 8 hours. Here also is a list of a few hikes available in the park for your perusal. And on one last note, good news is you can currently see the lava flowing into the ocean (aka fire hoses)! Hawaii County has opened up a public viewing area of the lava flow. Make sure to check the current conditions by calling (808) 961-8093. The viewing area may be closed due to hazardous weather conditions. So I now know why one purchases wedding invitations instead of making them. Aahhhh. I never would have dreamed that creating, editing, printing, double checking, doing it all over again, and again, and a 4th or 5th time again, would be such a huge challenge and a head ache. At least I can say, we’re almost done. I honestly think that making the invitations will be a snap compared to what we’ve been doing recently. All the hard work has gone into the designing and editing, making the invitations will be as easy as creating an assembly line. I think by now I’ve recruited enough victims, I mean volunteers, to make the process go pretty quick. I believe you all will be pleasantly surprised when you see the final results!! The flight prices to Kona (KOA)have dropped again and are back to a reasonable level. If you have not already booked, now is the time! We would love for you to join us. My previous post regarding flight prices has some information about getting a credit towards future flights if you purchased at the higher price. See it here for detail. As some of you may have heard through the grapevine, the price of flights from Seattle to Kona have dropped $110. If you have not already booked now is the time, I doubt they will go much lower but you never know…so don’t hold me to it. If you have already booked you may be able to get a credit for future travel. See the Alaska Air Contract of Carriage, Section I – General Rules, Rule 1AS, #3. Still looking for airfare deals? Check out Kayak. I know we have been a little lacking in the content department lately however I will try to get back in the posting groove. Here is a little something for your viewing pleasure. I found this in google earth, it is a wedding set up similar to ours. At the Fairmont Orchid there are lots of activities you can take part in! For instance, a 1 time payment of $65/person will give you access to the Fun & Sun Activity Pass. Good for your entire stay at the Fairmont Orchid. Things included in the Fun & Sun Activity pass are, snorkels, masks and fins, soft-top surf boards, kayaks and even small fishing nets. You can also take introduction classes on how to surf, how to snorkel, tide pool excursions and more! The Fairmont Orchid also is home to the Orchid Beachboys. Dont forget to go visit them at the Beach Shack. They Beachboys also offer kayaking/snorkeling tours, fishing, and surf lessons. Activities are on request, by appointment only. Contact the Beach Shack (808-887-7524) for reservations and pricing. And the dress shopping is over! That’s right, I purchased my wedding dress last night. One more thing done. Now I just have to sit back as patiently as possible and wait for it to be be made, shipped and delivered. Off to the next thing on the list!